With over 31-Years Professional “Show Car” Auto Detailing experience at Nationwide events including: www.CarShowScottsdale.com Barrett Jackson Scottsdale 12106, Car Craft, Hot Rod, World Of Wheels, just to name a few...Our highly trained master detail technicians can personally assist you with the proper product selection and usage to meet your specific vehicle needs. We only offer exceptional products that provide great results for all premium Line vehicles. Simply stated . . . “Buy the best detailing products and get the job done right the first time! 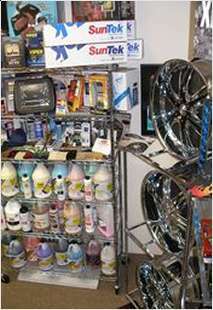 We distribute the world's finest car care products ... call 602.524.0807 for current prices! * All detailing supplies are sold in 1-gallon quantity unless specified otherwise. Waterproof, weather resistant sealant and protectant for vinyl tops, dashboards, rubber etc. Use between waxings like a "Quick Detail Product"
Cleans and polishes paint, glass, chrome, rubber and plastic. Has longer contact time than "Bug & Tar Remover" as it quickly loosens and removes silicone road tar, glue, oil, grease, polish, baked on carbon, overspray, etc. All three surface preparation bars are used to reduce spider webbing. Brightens, protects and enhances finishes on a wide variety of surfaces: metal, plastic, Plexiglas, rubber, vinyl, leather, wood, marble, tile, gel coat, basecoat/clear coat, glass and fiberglass. Also used for mold release applications and to protect paint from oxidation, overspray, surface rust, volcanic ash, railhead dust and industrial fallout. Designed for fast removal of tar, CosmoLine, overspray, etc. "Thanks . . . the Anti-Static Showroom Conditioner I purchased for my black 2008 Lexus LX570 is great!" Based at the Scottsdale Airpark we also serve all of Phoenix, AZ and surrounding valley communities we distribute the world's finest car care products. Call 602.524.0807 or contact us for current prices! Serving Scottsdale, Phoenix, North Scottsdale, Tempe, North Phoenix, Cave Creek, Carefree, Paradise Valley, Fountain Hills, Arizona with the world's finest car care products.